in case anyone else is a fan of joe madureira, he's making a return to comics. he'll be teaming up with jeph loeb, writer of the batman: hush storyline with jim lee as well as television's smallville, to work on an as yet undisclosed project for marvel comics. the annoucement to what the project will be can be found in the issue of Wizard magazine hitting comic shops on august 31st. for now, here is an image joe mad mocked up for the wizard world con in chicago just a week ago. Last edited by Pandora's Eyes; August 13th, 2005 at 09:15 PM. The cover for that image came out this last wednesday House of M #1 limited edition. Most shops only got one so if you want one probably have to go to ebay. 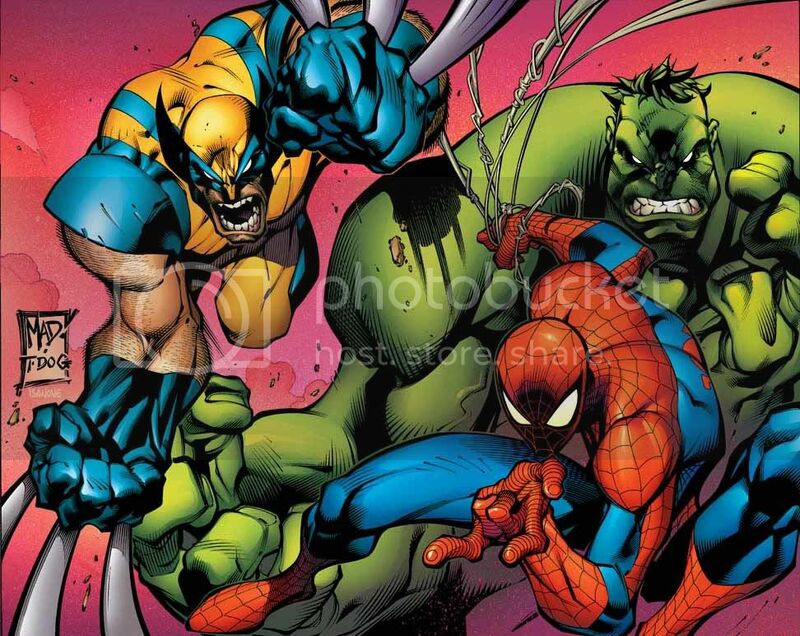 People think the book will be Spiderman cause he wanted to do that a long time ago and I would agree, it was said that it would be about one of the three characters on that image..so it's either a book about Wolvie, Spidey or Hulk. Here's a link for inks for that image(it's kinda large)..
"..a return to comics"? He actually left at a certain point? I think Joe Mad took off to develop vidjo games, though I'm not sure what ever came of that. I dont think he's done anything since Battle Chasers a few years ago. He left BC and went to games first on Dragonkind, Exarch, then Tabula Rasa. He also did a few covers for Street Fighter and a back up story for SF and then a few covers for Darkstalkers, plus 3 more DS covers that are still to come..and few other pieces for the games for magazines. Great! Hope he'll finish BC. I can't help but look at Joe Mad's return to comics like a dog coming home with it's tail between it's legs. Reality must've set in, he came to terms with his obvious lack of skill, ability, and interest in any other career fields. Now, let's just hope he doesn't let the next gen game systems distract him like it did last time. As much as I like Joe's style, I wish he'd just stick to BC. The story wasn't perhaps the greatest, but I liked it, as well as it wasn't "another" Spiderman/Batman/X-men comic. I find it uninspiring to see the "return" of legends being put to use in your average comic, even if the writer is good. I mean, if they are such legends, why don't they work on their own comic? Seeing them return to these generic comics is like seeing a craftsman return to simple crafting, instead of pursuing his own stuff. Maybe I'm just full of it and I don't know what I'm talking about, but this is what I feel about it. And my condolences go to Joe for being on so many projects that never saw the light of day; that must have sucked. Disclaimer: Just to make whatever point I was trying to make more concrete, I collect Spiderman still, but only the ones Straczynski is writing, because he got my vote after he did Babylon 5. Haha true. His art on it was soo good, I wish he would have at least released 10 before stopping. And in Wizard magazine he says after Ultimates he wont do comics for quite some time. Maybe he'll return to Battle Chasers in the beginning or middle of next decade, but at that point alot of the people may have forgotten about it! Art: Collaboration with Joe Madureira... and some other stuff.